Spectrum Brands, distributor of Russell Hobbs and George Foreman small appliances, has unveiled its Mother’s Day product line-ups for the two brands, with a strong focus on colour and healthy eating underpinning the range. Spanning food prep, bench top cooking, breakfast appliances and floorcare, the range includes a number of new products from Russell Hobbs as well as a new flagship grill from the heavyweight champion-endorsed George Foreman brand. At the centre of the Russell Hobbs line-up is its new Colour Control range of benchtop food prep appliances, including the Colour Control Blender (20230AU, RRP $99.95), Multi Food Processor (20240AU, RRP $149) and 3-in-1 Stick Mixer (20220AU, RRP $99.95). 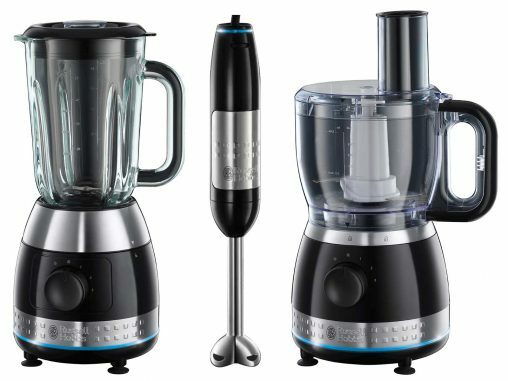 With features such as titanium-coated stainless steel blades and stainless steel front panels, each appliance also features a light-up ring around the base that changes colour based on the blending speed (such as red for pulse, green for blending or blue for slicing and shredding). “Every product in the Colour Control range is designed to be simple to use, taking the guess work out of the speed and function selection,” he said. The Russell Hobbs Colour Control range, including the Blender, 3-in-1 Stick Mixer and Multi-Food Processor. 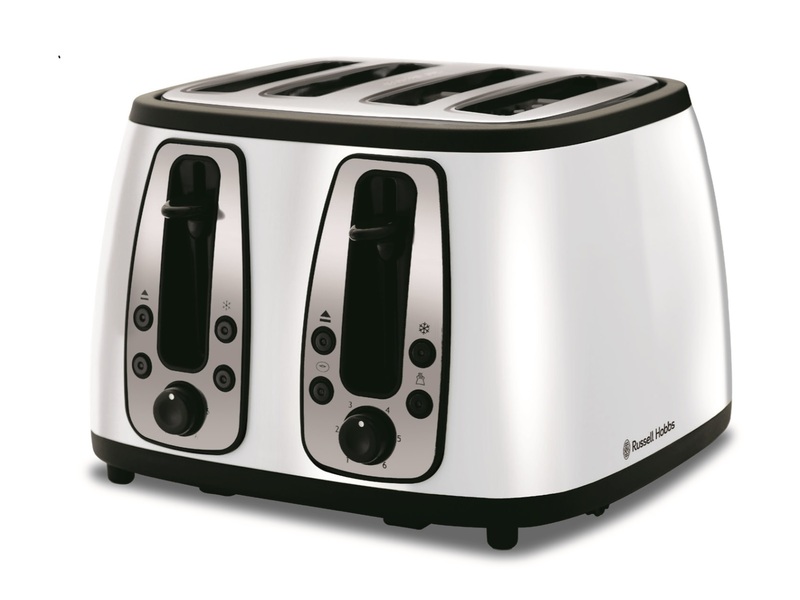 Colour also continues to be a major message for Russell Hobbs in breakfast appliances, with the brand extending its 2013 Heritage range of coloured appliances with a new White Silk shade, available in a Kettle (RHK32WHI, RRP $99.95), 2-Slice Toaster (RHT22WHI, RRP $79.95) and 4-Slice Toaster (RHT24WHI, RRP $99.95). Trend watchers take note: according to product manager Monika Kamienowska, “White is no longer that safe and neutral colour… it really has developed its own cult status”. Cult Status: Russell Hobbs’ White Silk 4-Slice Toaster. 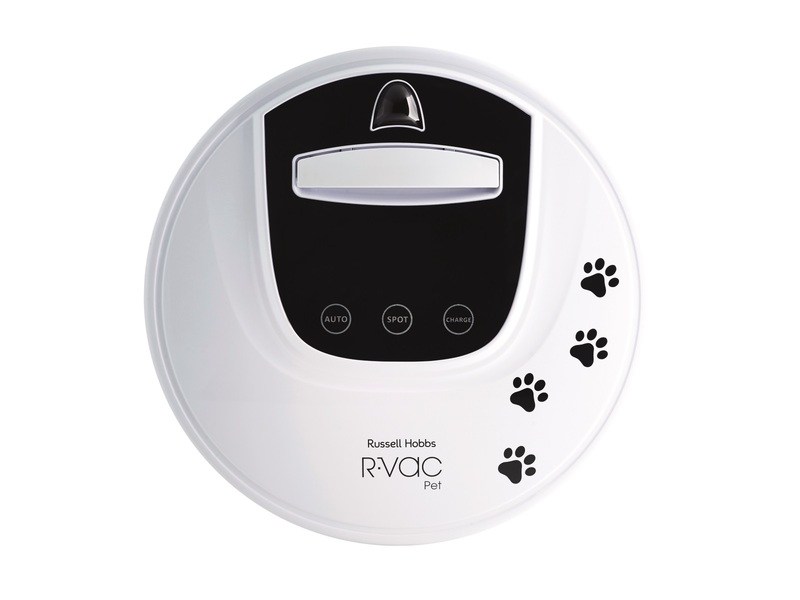 In floorcare, Russell Hobbs has also added to its existing R-Vac robot vacuum range with the new R-Vac Pet (RHRV200, RRP $499) — a robotic cleaner that features bristles to effectively pick up pet hair, a quiet operating volume and a special UV light under the chassis of the vacuum that the brand claims “disinfects and sanitises floors”. The Russell Hobbs R-Vac Pet. 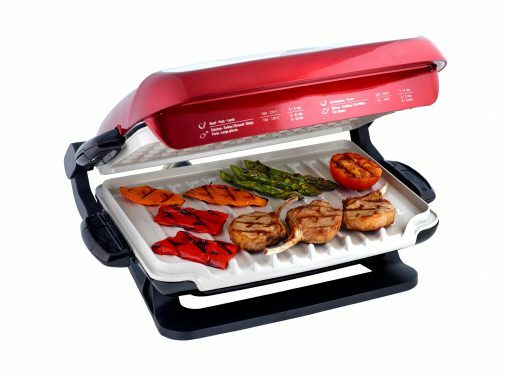 Trying to one up its competitors, the Grill features removable and dishwasher-safe ceramic grill plates (which can be removed while hot) as well as an interchangeable ceramic baking dish insert. The plates makes direct contact with the heating element for fast heat-up times, and because they are coated in ceramic, they can reach a high 260° Celsius “true” searing temperature for bursts of 90 seconds. Similar to other George Foreman grills the sloping design drains fat into a drip tray (the sloping angle can be adjusted flat with a lever on the side), but the addition of a baking dish allows users to cook meals such as brownies or pasta bake. The Champ is here: George Foreman’s ‘The Champ’ All-in-One Grill. The entire Russell Hobbs and George Foreman Mother’s Day line-up is due in retail stores from March this year.